Do Pete’s feet ever touch the ground! WadStock beer and music festival 26th July. Dancing Constant Billy at WadStock. This entry was posted in Dance Outs on July 26, 2014 by Nigel Northcott. We’re the Oxford Mail again! From the Oxford Mail, 24th July 2014. This entry was posted in Dance Outs on July 24, 2014 by Mick Phillips. Pete oversees the ‘elf and safety arrangements. So good, we stopped traffic. A nice piece from the Oxford Mail. From the Oxford Mail, 2014-07-22. 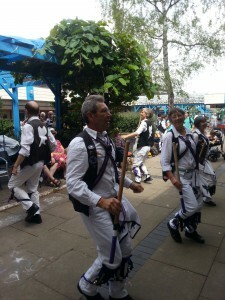 This entry was posted in Dance Outs on July 22, 2014 by Mick Phillips. 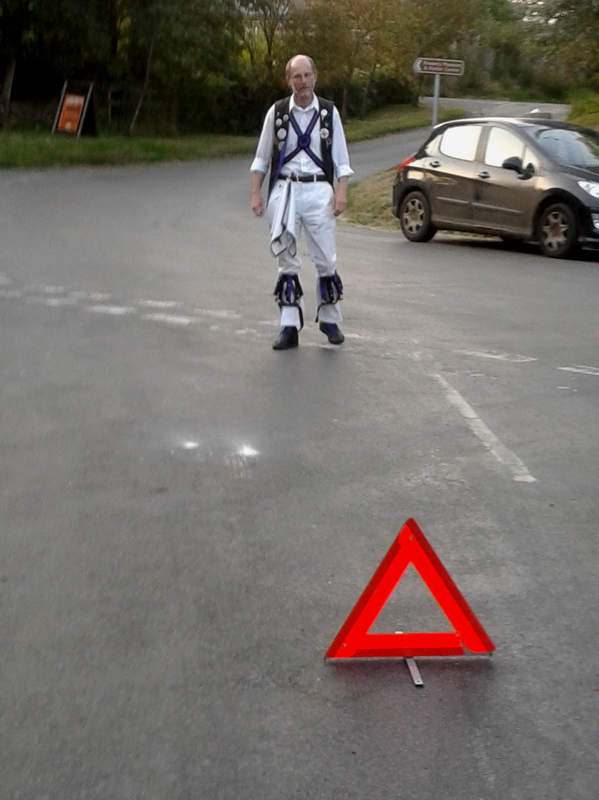 Even Morris dancers rarely consider Morris much of a spectator sport. 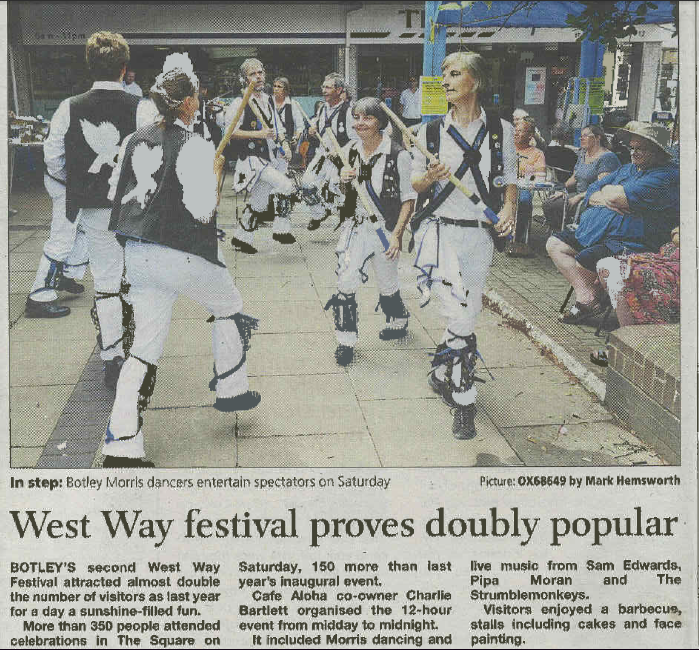 So, it’s always a pleasure – and a considerable surprise – to find what actually amounted to something of a crowd waiting for us at the Botley Westway Festival on Saturday 19th July. 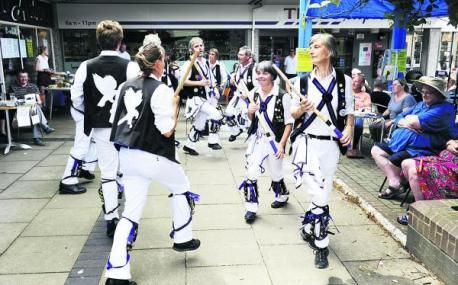 Dancing ‘Young Collings’ at the Botley Westway Festival. We did a half hour spot and somehow failed to scare off all those out to enjoy the festival. 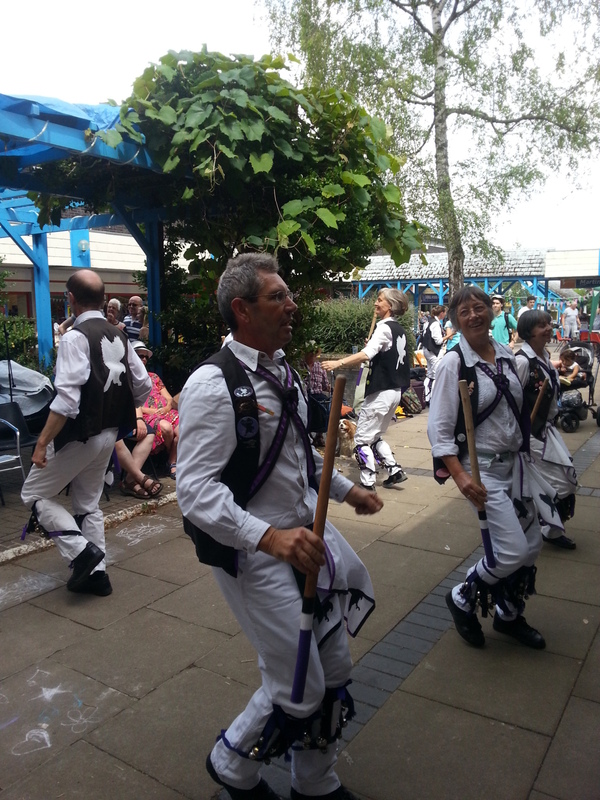 Dancing ‘Young Collins’ at the Botley Westway Festival. We tried hard to entice bystanders to come and join their local side. Fingers crossed. This entry was posted in Dance Outs on July 21, 2014 by Jim Hague. Another sunny summer evening? Whatever has happened to the traditional English summer? 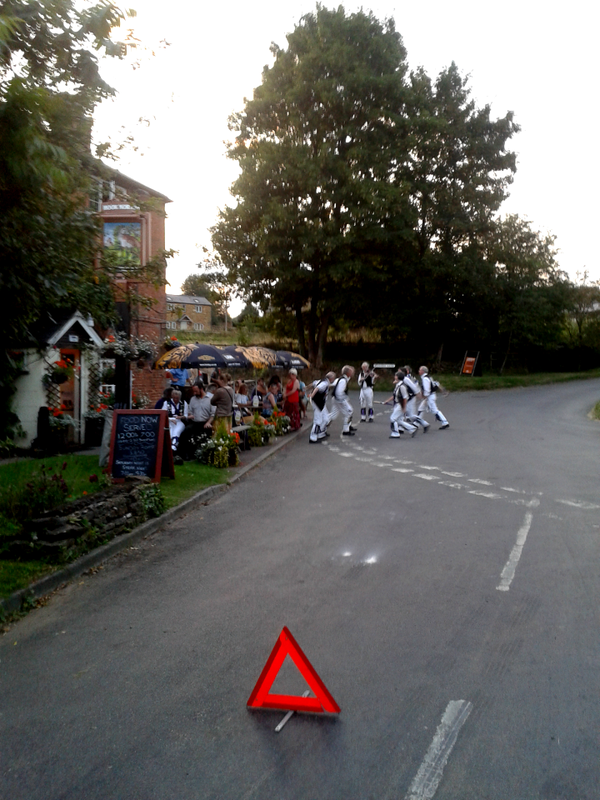 The evening of Thursday 17th July saw us out at another of our favourite haunts, the Eight Bells at Eaton with our guests, Old Speckled Hen. 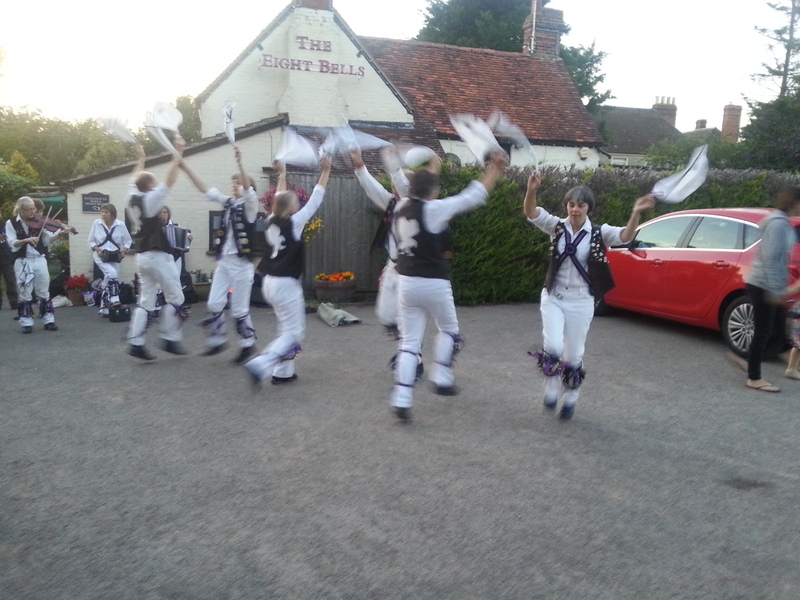 Dancing ‘Sidesteps’ at the Eight Bells, Eaton. A warm and sultry evening, and Tommy’s legendary Coronation Chicken sandwiches. Yum. Old Speckled Hen at the Eight Bells. Despite being based in Botley, it’s been a long time since Havoc visited the Seacourt, the pub in the heart of Botley. 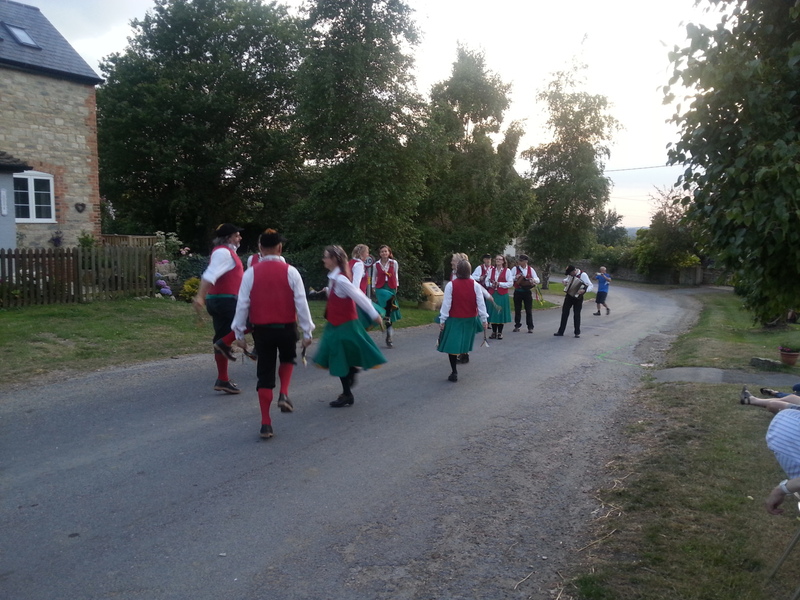 But following a warm invitation we danced out the front of the pub on July 10th another fine evening, accompanied by Wolvercote Morris. We found a ready audience, particularly from the people queuing at the bus stop outside the Seacourt. We’d forgotten to bring our charity buckets, so Mick’s hat was pressed into service. 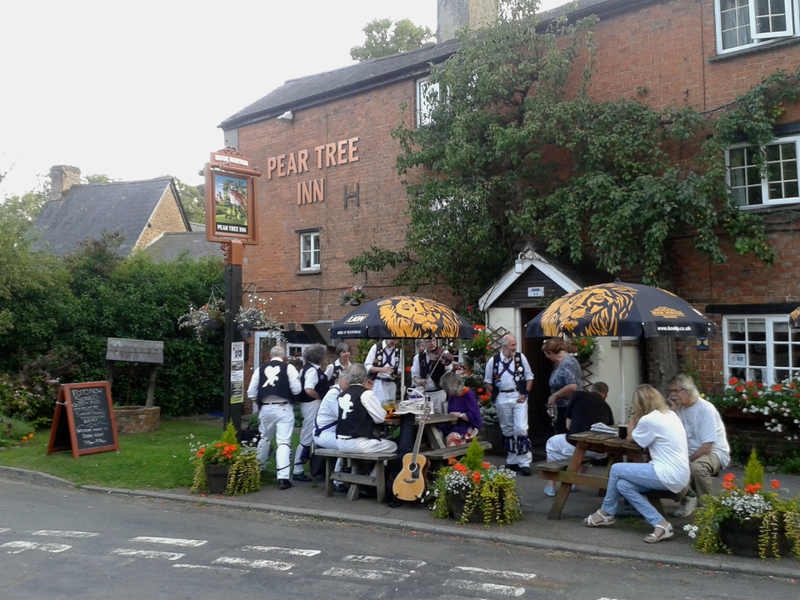 After dancing, we retreated inside the pub and had a relaxed music session. Let’s hope this we’ll be visiting the Seacourt again. This entry was posted in Dance Outs on July 20, 2014 by Jim Hague. Our first dance out of July saw us at the Fox in Denchworth as guests of Icnkield. The Fox is a thatched pub in the Vale of the White Horse. We danced outside on the patio beside the large garden on a perfect summer evening. Much to the joy of all concerned, the Fox provided an enormous quantity of sandwiches and roast potatoes to encourage us. 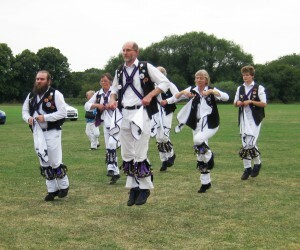 I for one struggled to jump very high during dances after they appeared. 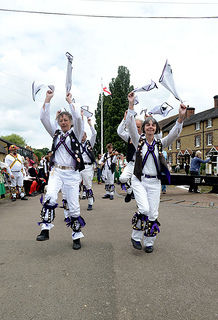 Despite a full weekend of dance, Havoc also turned out on at one of our favourite pubs, the Prince of Wales at Shippon, on the evening of Sunday 29th June to mark the end of Phil and Karen’s final weekend in charge. 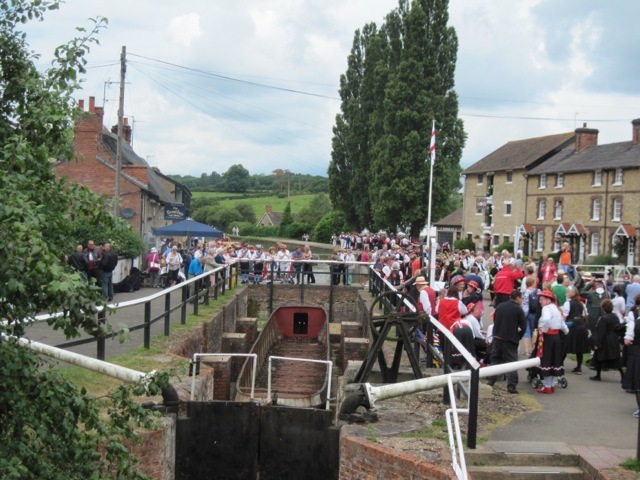 A glorious Northampton shire canal side location at Stoke Bruerne and 16 Morris sides and what have you got – a great weekend! Havoc canal-side at Stoke Bruerne. Between 27th and 29th June, ten Havocs spent a great weekend as guests of Rose and Castle Morris. Rose and Castle, our weekend hosts. 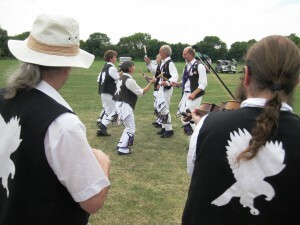 After setting up camp on a rugby field we were greeted to a supper of chilli on Friday night along with around 200 dancers; who being Morris and lubricated with falling down liquid, broke into an impromptu session. 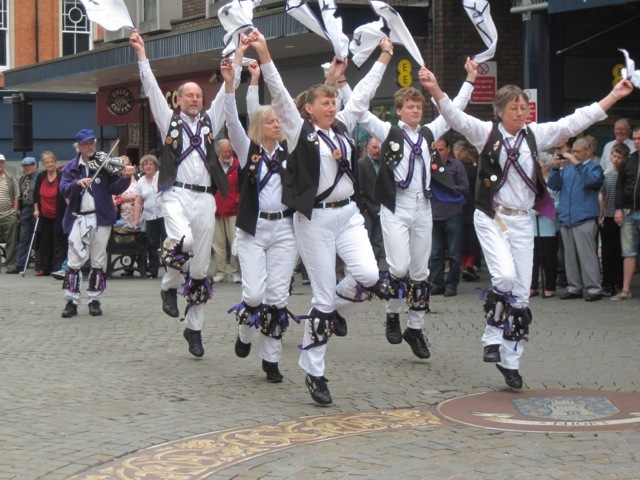 Saturday started with a cooked breakfast and we were off – to dance at 4 venues around the County; travelling in two groups in four coaches. It was nice to be given a special welcome as a ‘Cotswold side’; most of the sides were North West clog – from as far away as Manchester. Saturday evening the hosts provided a veritable banquet and a grand ceilidh – Oliver outpaced the other side members – in particular Nigel who used the excuse of a recent illness to go to bed earlier – mind you sleep was a struggle – Greg had also gone to bed early! Massed Morris sides by the canal at Stoke Bruerne. 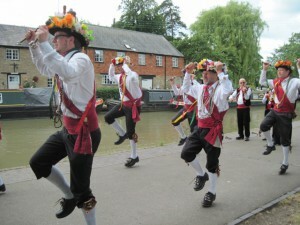 Havoc dancing beside the canal at Stoke Bruerne. 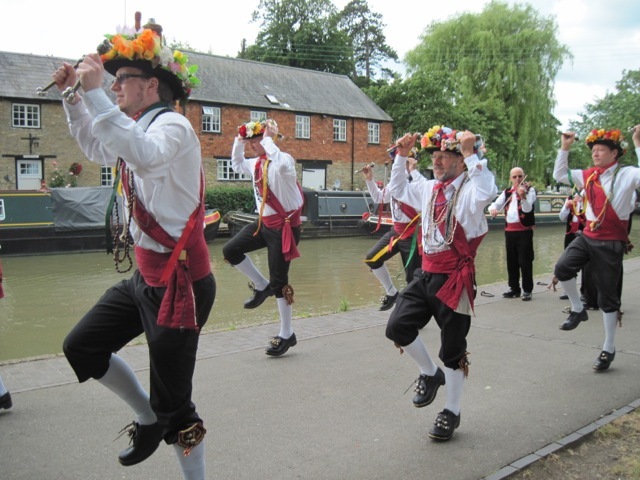 Sunday morning another cooked breakfast and a leisurely morning before setting off to dance at the lock-side in Stoke Bruerne – a splendid location – with more than one pub and 16 sides all dancing on adjacent spots. Despite my early night – I was told I looked tired – I had not slept well, the horse in the nearby field had been snorting all night – ‘It wasn’t a horse’, said Lesley – who knew something I didn’t!! 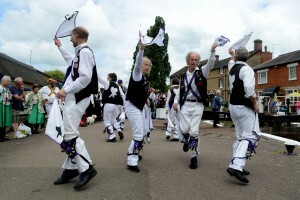 But what a great weekend of dancing, eating and imbibing; thanks to Queens Oak and Rose and Castle Morris. 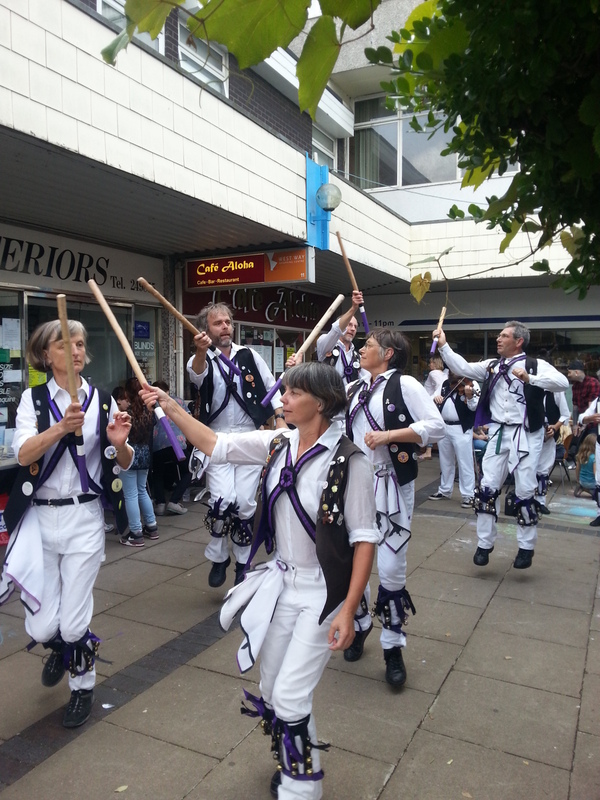 In Wellingborough on the Rose and Castle Weekend. 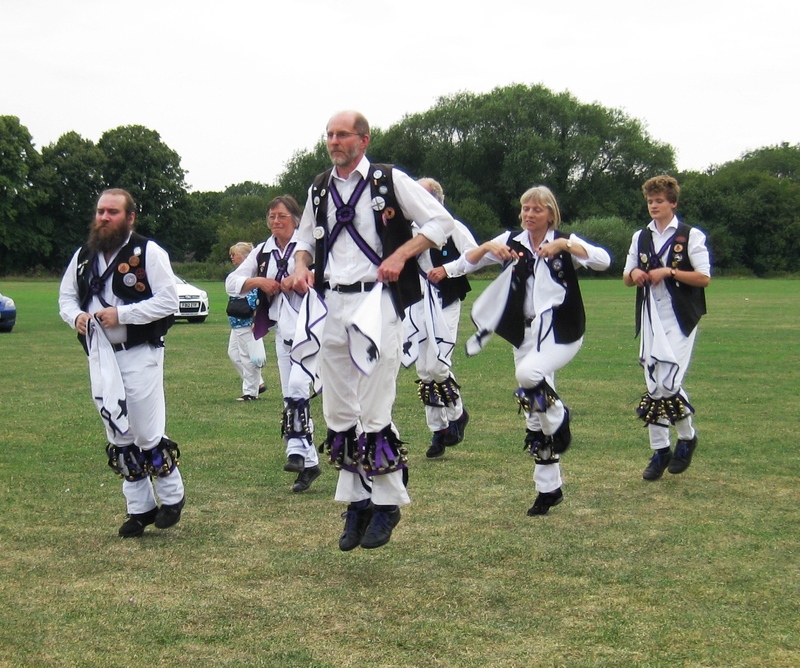 This entry was posted in Dance Outs on July 20, 2014 by Nigel Northcott.